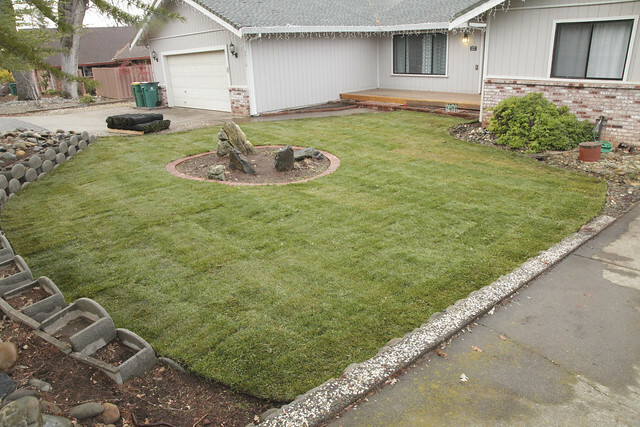 When we first saw our future home online via MLS we were presented with a beautiful green front yard. On the day we physically step foot on the property we were greeted with the current homeowner attempting to water dead grass. I guess he didn’t realize that spraying weed killer over the lawn would kill the weeds and the grass. 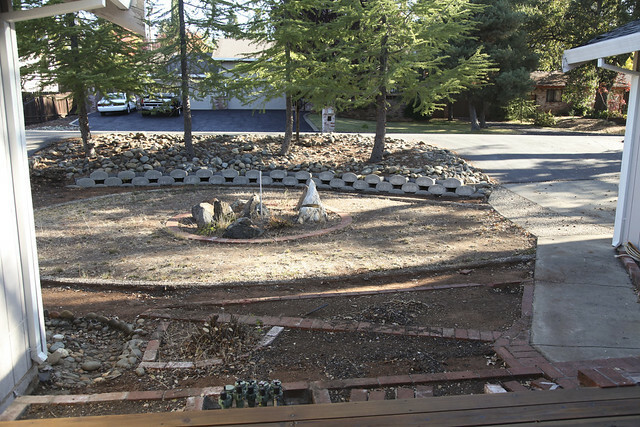 The yard consisted of dead grass surrounded by a cement horseshoe outlined with pea gravel plus a weird brick layout near the steps, a poorly maintained rock garden in the middle, an awkward white box covering the sprinkler valves and no working irrigation. 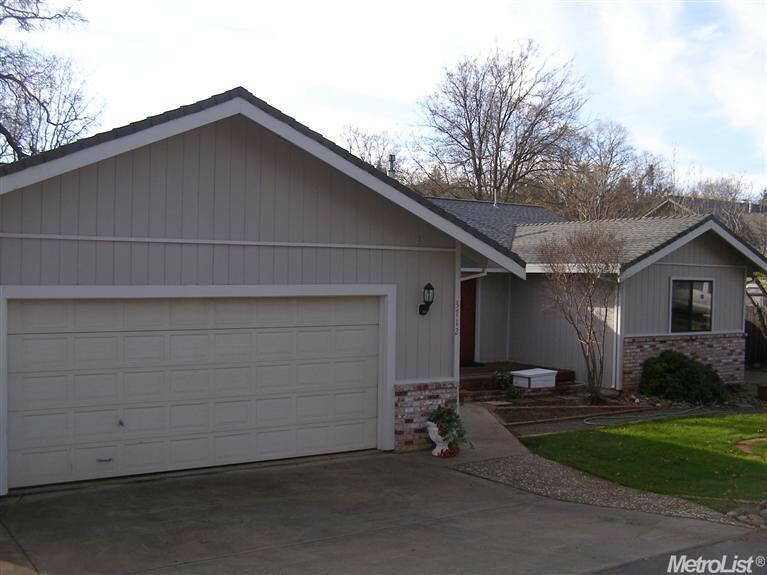 Definitely not great curb appeal at all. 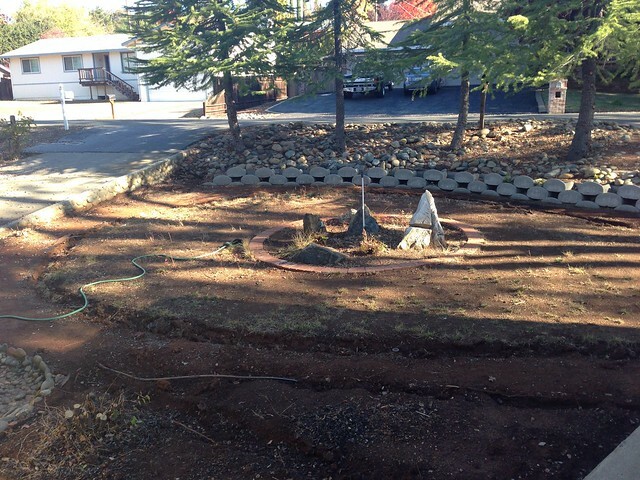 We consulted with Joshua’s adopted dad (he’s a professional landscaper) on what to do with our front yard. 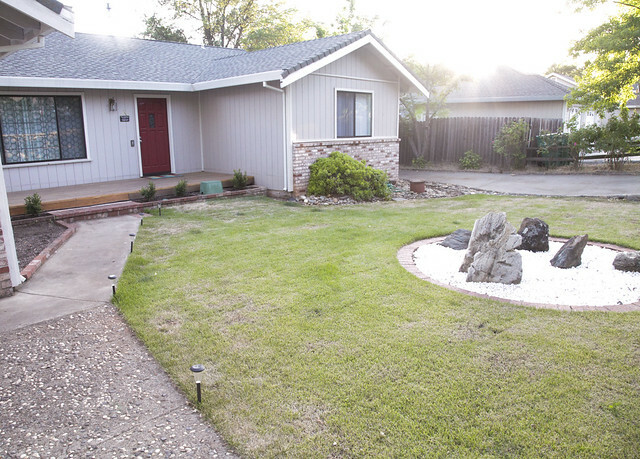 We knew we wanted to keep things simple and just have a nice yard with grass and some shrubs. The first step was to clear the clutter! 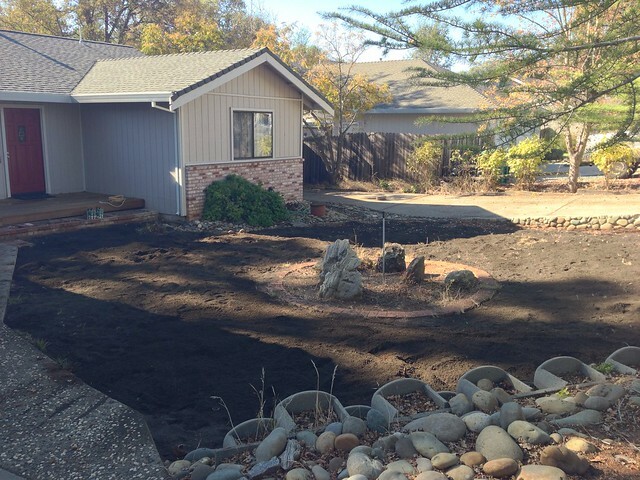 We dug up all the pea gravel, removed the random trees (like the one right in front of the doorway) and killed any remaining weeds. 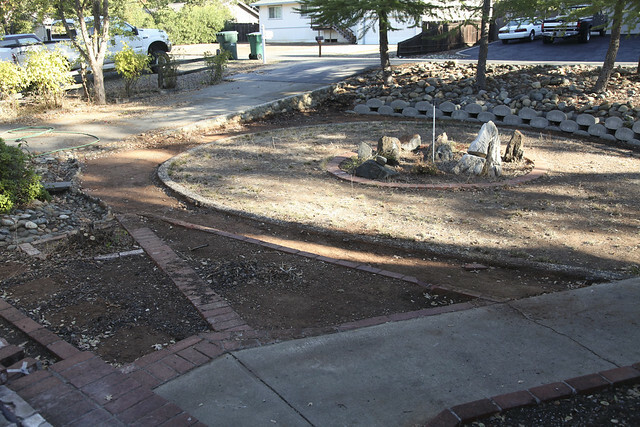 Then we removed the weird brick pattern and the cement horseshoe. 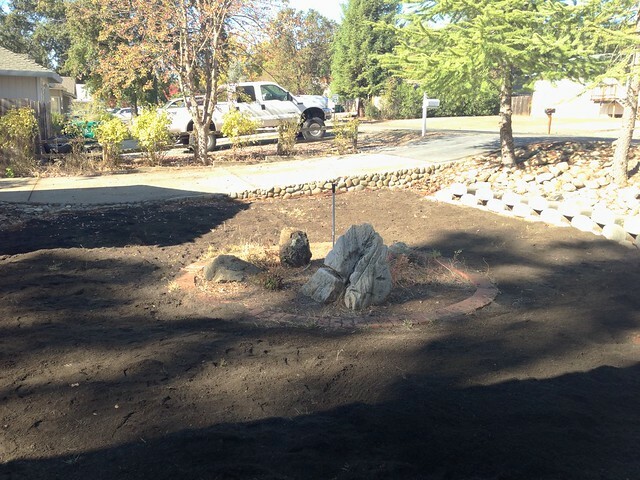 Now that everything was removed it was time to prep the yard for sod and irrigation. We laid down a few inches of amendment on top of the current dirt. Then we used a tiller to mix everything up. 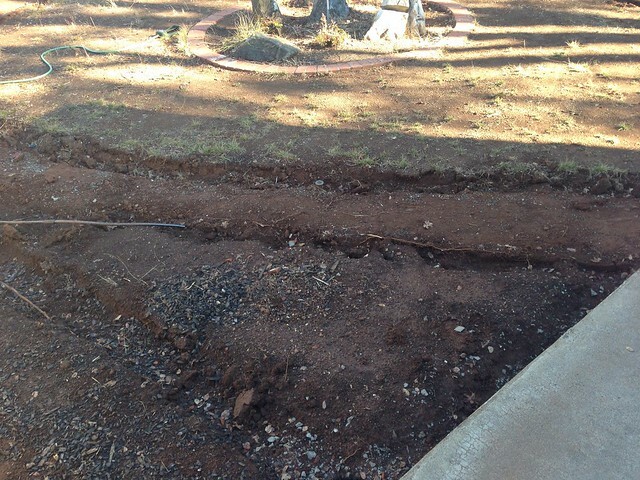 We also rented a stump grinder from Home Depot to take care of the two tree stumps. 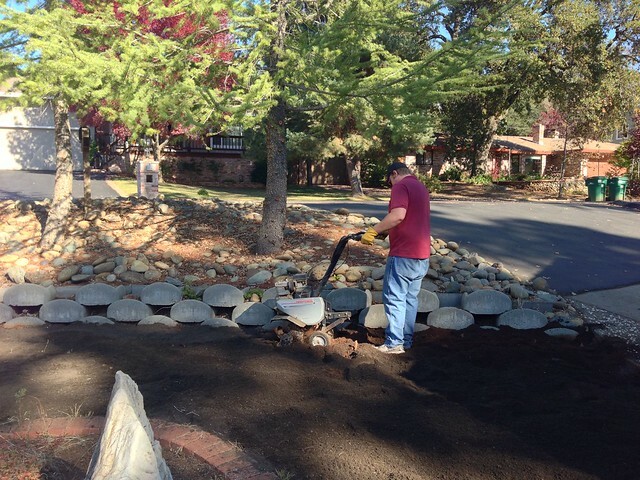 Joshua’s adopted dad helped us with the irrigation, and then we were finally ready to order sod! 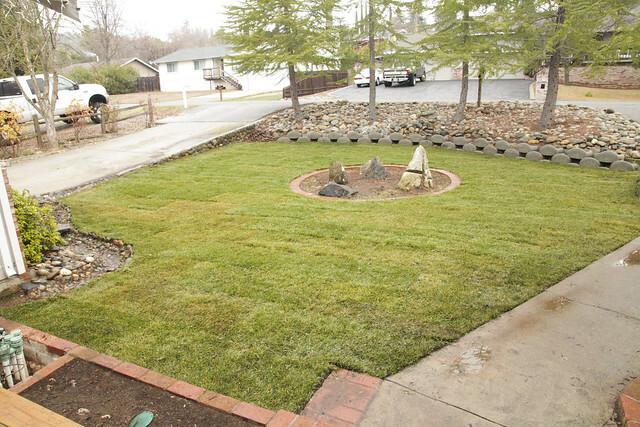 We started off 2014 with a beautiful green lawn! 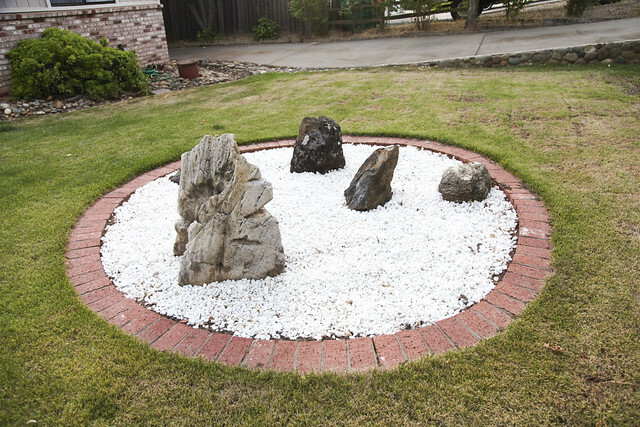 Then we topped it off with some solar lighting and white rocks in the middle. The previous two weekends were spent prepping the irrigation and planting shrubs (Japanese Boxwood ‘Green Beauty’) in front of the porch. 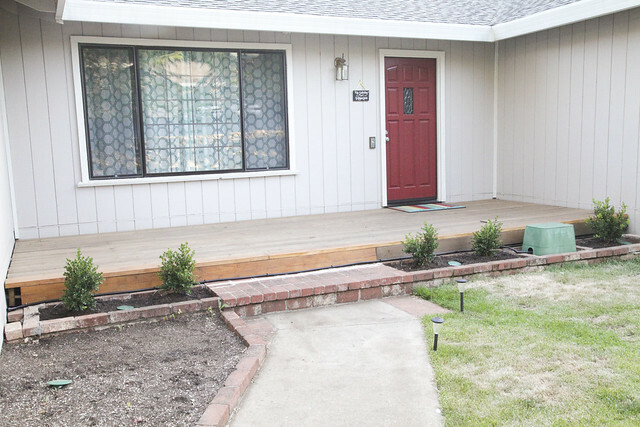 All that we have left is finding something to plant near the side of the garage, replacing the front door, and adding some decor to the porch!